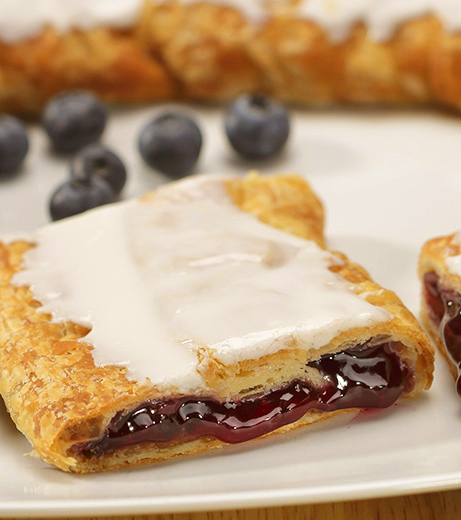 If you love blueberries – this will be your favorite! 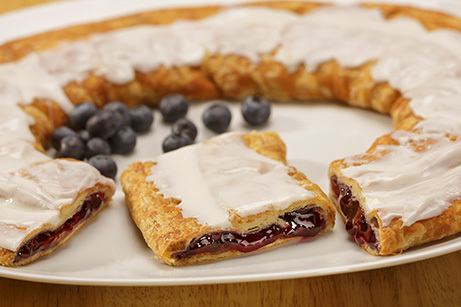 Our Blueberry Kringle has a rich, flaky crust that is generously filled with ripe sweet blueberries with a hint of tartness–topped with sweet vanilla icing. 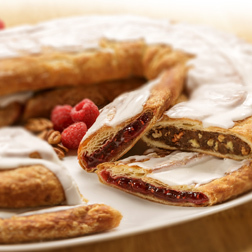 A delicious treat to go with morning coffee. Wheat flour, margarine (interesterified soybean oil, water, salt, mono- and diglycerides, colored with annatto/turmeric. Calcium disodium edta added as a preservative. Artificial butter flavor. Vitamin a palmitate added. ), sugar, blueberries, high fructose corn syrup, brown sugar (sugar, molasses, cane syrup), eggs, corn syrup, modified food starch, contains 2% or less of the following: water, soy protein, soy lecithin, yeast, dextrose, salt, xanthium gum, citric acid, natural & artificial flavors, potassium sorbate preservative, sodium benzoate preservative, tocopherols preservative, calcium carbonate, partially hydrogenated soybean & cottonseed oils, maltodextrin, agar-agar, calcium propionate, soy flour, canola oil, corn starch, cinnamon, malted barley, color added.